Catherine Fuller, who turns 88 next month, still shudders at the idea of a superhighway cutting through the heart of the Shaker Lakes nature preserve, destroying 200 acres of wildlife and wiping out hundreds of nearby homes. She first got wind of the plan 43 years ago at a garden club meeting at the North Park Boulevard home of Mary Elizabeth Croxton, just across the street from the lower Shaker Lake. "We were horrified," she said. "We immediately said, It's got to be stopped, no question about it.' 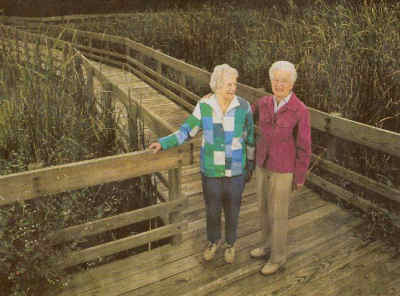 "
Catherine Fuller, 87, and Kathleen Barber, 82, stand on a deck in the middle of the Shaker Lakes nature preserve. The two women were on the front lines 40 years ago in a battle to stop two freeways from running through Shaker Lakes. The meeting of 11 women was a call to war, pitting ladies' garden clubs against a powerful, steam-rolling freeway industry and a forceful county engineer while sowing the seeds of a momentous grass-roots uprising that drew national media attention. "It wasn't hard to mobilize, said Kathleen L. Barber, 82, one of the many frontline activists in the fight. "People were outraged. When your home is threatened and your community is threatened, you mobilize." Fuller and Barber are founding members of the Shaker Lakes Nature Center, which celebrates its 40th birthday this month. The center was born in the heat of the freeway fight and stands today as a monument to victory. "The whole East Side should take those ladies out for a couple of cold beers," said Tom Bier, an urban studies professor at Cleveland State University. "Their battle marks one of the most significant bits of history in the last 50 years because of what didn't happen. They actually stopped the highway industry, and that's big." A half century ago, when America was linking its cities with high-speed highways, no community was safe from the threat of earthmovers and concrete trucks, not even the richest community in the nation -- Shaker Heights. The 1960 census showed that Shaker Heights had the highest median household income in the land, but that had no effect on the freeway planners. 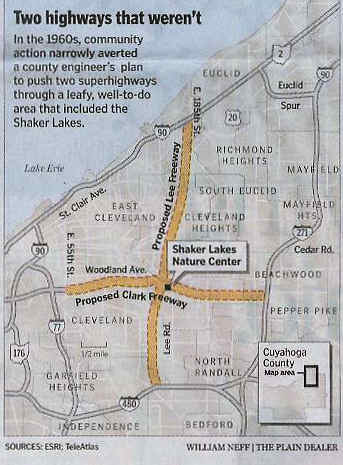 In October 1963, Cuyahoga County Engineer Albert Porter unveiled the proposed Clark Freeway, an east-west route linking Cleveland with Pepper Pike. It was to run east from East 55th Street near Broadway in Cleveland to Interstate 271 in Pepper Pike. It would have ripped through the Shaker Lakes and cut a swath along Shaker Boulevard into Beachwood. Once the Clark was finished, the plan was to run a north-south route, called the Lee Freeway, connecting I-90 near Lake Erie to the Ohio Turnpike. The Clark and the Lee were to intersect where the Shaker Nature Center is today. "To exchange this park of irreplaceable beauty for a mass of concrete roadway would be an unthinkable act of vandalism," Croxton of the Village Garden Club told the New York Times in October 1966. The two freeways would have taken 1,370 homes and 105 commercial properties in Cleveland, Cleveland Heights and Shaker Heights, including the homes of such prominent people as Cleveland Orchestra conductor George Szell, U.S. Ambassador to Austria Milton Wolf and Cleveland Mayor Carl Stokes. They would have also destroyed the final resting place of early Shaker settler Jacob Russell, a Revolutionary War soldier buried near Horseshoe Lake. Croxton and dozens of other garden club ladies, joined by a broad coalition of residents and environmentalists, launched a massive campaign led by public officials and prominent residents. But Porter pushed hard, saying a delay in the project would result in losing millions of federal highway dollars. He called Shaker Lakes a "dinky little park and two-bit duck pond" and described the opposition as a "chintzy, spoiled bunch." In November 1976, he was voted out of office. That same year, the nature center opened a small retail shop called the Duck Pond Gift Store. In 1977, Porter was convicted of theft in office. He died in 1979.